'A League of Their Own' together? 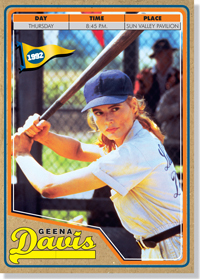 Hollywood actress Geena Davis told the story 20 years ago of an all-women's professional baseball team trying to establish itself on a biased playing field in the film "A League of Their Own." When she comes to Sun Valley this week to introduce the popular movie to today's audiences, she will also be explaining why, even today, there needs to be a fight, from dugouts to cinema, for gender equality. "I think [the movie] is a great reminder of how successful movies starring women can be," she said. "But we get maybe one reminder every year. We have 'Hunger Games' and 'Brave,' which are big hits with female leads, who, coincidentally, are both archers. The only problem is we don't seem to get any momentum." Davis founded her namesake Institute on Gender in Media, the leading nonprofit working behind the scenes in Hollywood to improve media images of girls and women, after watching television with her daughter, now 10. Founded in 2004, the institute and its programming arm, See Jane, are engaging film and television creators to dramatically increase the percentages of female characters—and reduce gender stereotyping—in media made for children 11 and under. "My whole theory is that since we're showing kids an incredibly imbalanced world from the first media they consume is that it is something that they take up unconsciously. It is presented to them over and over again that girls seem to take up less space in the world and don't take up the important things that we do," she said. "Nobody wants to send that message, and nobody is consciously leaving girls out, but when you point it out, people see it and they want to fix it." The institute's researchers looked at the past 20 years and found no improvement in the percentage of female characters, but the anecdotal evidence that Davis has collected since shows a slight increase, which a study planned for 2015 could reveal. "I am positive we will see changes by then," she said. "Anecdotally, we know someone is taking the message to heart, people tell us they've changed their movies. We're confident that change is happening. If we got to 35 percent women, that would be the needle moving enough to say the needle moved." The actress, who is currently working on an A&E miniseries based on the book "Coma," to be released on Labor Day weekend, said that when she is with her kids, who include twin 8-year-old boys, she's "hyper aware" of their media influences. "We usually don't let the kids watch TV by themselves," she said. "It's not in a fanatical way, but you never know what's going to show up. I keep up this running dialogue about what's going on, like 'Isn't that strange, why was that all boys? Do you think a girl can do that?' Just opening up topics to consider." Davis, also know for the iconic character she created in "Thelma and Louise," will introduce a free community screening of "A League of Their Own," presented by Zions Bank, at 8:45 p.m. Thursday, July 26, at the Sun Valley Pavilion at Sun Valley Resort. She will be introduced by Paralympian and Sun Valley native Muffy Davis. On using the film's re-release to share her cause, Davis thinks it's a perfect fit. "I still have as many young women or teenage girls that say, 'I love that movie—I play sports because of that movie' as I did when it first came out," she said. "It speaks to the longevity of this film."